Words I Write Crazy: We Have the Cover of the Chronicles of Elantra #14!!!! 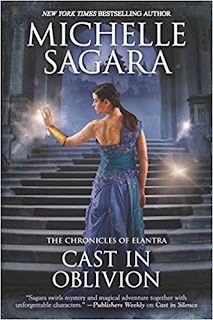 We Have the Cover of the Chronicles of Elantra #14!!!! Yeah, we have the title, cover, and synopsis, of Cast in Oblivion by Michelle Sagara! Kaylin wasn’t sent to the West March to start a war. Her mission to bring back nine Barrani might do just that, though. She traveled with a Dragon, and her presence is perceived as an act of aggression in the extremely hostile world of Barrani-Dragon politics. Internal Barrani politics are no less deadly, and Kaylin has managed—barely—to help the rescued Barrani evade both death and captivity at the hands of the Consort. Before the unplanned "visit" to the West March, Kaylin invited the Consort to dinner. For obvious reasons, Kaylin wants to cancel dinner—forever. But the Consort is going to show up at the front door at the agreed upon time. The fact that she tried to imprison Kaylin’s guests doesn’t matter at all…to her. A private Barrani Hell, built of Shadow and malice, exists beneath the High Halls. It is the High Court’s duty to jail the creature at its heart—even if it means that Barrani victims are locked in the cage with it. The Consort is willing to do almost anything to free the trapped and end their eternal torment. And she needs the help of Kaylin’s houseguests—and Kaylin herself. Failure won’t be death—it’s Hell. And that’s where Kaylin is going. Oh, man, this book looks so great! Her outfit is just like the one on Cast in Flame, just in different colors! Love it! I absolutely love the look of this cover, the title, and the synopsis! I just want this book! I'm so glad for NetGalley, because I don't think I could wait till January for this book! What about you guys? Happy reading!